Even if you aren’t suffering from an autoimmune condition, simplifying the food you eat can have a drastic impact on your life. Autoimmune complications (taken collectively) are the third leading cause of death in the United States – and gluten, dairy and sugar-filled foods could be making things worse for many. 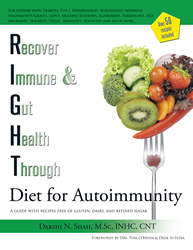 To combat the increasing number of autoimmune disorders, author and board-certified nutritional therapist and health coach Darshi Shah adapted a healing diet of plant-based foods free of common trigger ingredients such as gluten, dairy and refined sugar. The R.I.G.H.T Diet is the first plant-based/vegetarian diet designed to help manage autoimmunity, and Shah shares over 50 of these original recipes in her new cookbook. A diet free of gluten, dairy and sugar like the R.I.G.H.T Diet has also been shown to improve symptoms of non-autoimmune issues like autism spectrum disorders and Down’s syndrome. For more information, visit http://www.darshishah.com. Darshi Shah is a board-certified nutritional therapist and health coach specializing in dietary and lifestyle transitions and empowering clients to success. Shah has consulted to Beyond Celiac (formerly the National Foundation for Celiac Awareness), and is a member of the International Association of Health Coaches, the American Association of Drugless Practitioners and will soon be a Certified Gluten Practitioner. She currently resides in Katy, Texas with her husband and two children.